Many of the different districts and neighbourhoods within the city are separated by River Moscow (Moskva River), which forms a natural boundary and also provides great views and endless riverside attractions. The very heart of Moscow lies within the actual arc next to the Kremlin building, and this forms the city centre itself, where the Red Square is surrounded by iconic Russian structures. Within the district of Arbat, the street of the Ulitsa Arbat is famous throughout Moscow for its regular art market and local artists, who can be found here poised and ready to paint your portrait. 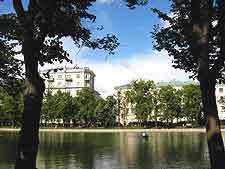 Other prominent neighbourhoods include the Barrikadnaya, home to both the city zoo and White House, and the district of Khamovniki, close to the Luzhniki Stadium, perhaps best known for being Russia's premier sporting venue during the Olympic Games of 1980. Edged by the streets of Lubyansky, Mokhovaya, Okhotny and Teatralny, Moscow city centre is where it all happens and is home to many of the city's most famous landmarks. Red Square (Krasnaya Ploshchad) is situated directly alongside the north-eastern side of the Kremlin itself and is dominated on its southerly side by the iconic 16th-century St. Basil's Cathedral, with its crazy mixture of colours and distinctive architecture. 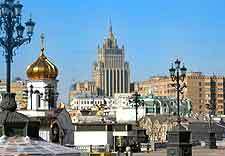 The Tverskaya Ulitsa and become an important hub in Moscow and integral to the Tverskoy district of today. This neighbourhood is filled with places to sleep, eat and shop, and is immediately characterized by its wealth of historic buildings and period architecture. Constructed in 1629, the Church of the Resurrection (Tserkov Voskresenia) is worth a look, as are the many parks that line the Tverskaya Ulitsa itself. The Tverskoy district is particularly famous in Russian history for being the site of the very first McDonald's in Russia, which still remains on the Pushkinskaya Ploshchad today. 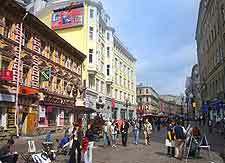 The district known as Arbat is bordered on both of its sides by the Moscow River and includes the neighbourhoods located directly south of the Nova Arbat Ulitsa and also those on the northerly side of the Garden Ring. The Ulitsa Arbat is a definite highlight and this pedestrian mall stretches for just over 1 km / 0.5 miles, between the Smolenskaya Ploshchad and the Arbatskaya Ploshchad. At the intersection of the Kudrinskaya Ploshchad and the Garden Ring you will find the Barrikadnaya district, where the main draw card is the Moscow Zoo, on the corner of the Bolshaya Gruzinskaya Ulitsa and the Barrikadnaya Ulitsa. The Moscow White House is another attraction and is just a short stroll from the US Embassy (Belyi Dom), being situated on the Krasnopresnenskaia Naberezhnaia. Surrounded on three of its sides by the winding Moscow River, the Khamovniki district is also edged by the Garden Ring, which lies to its north. When here, look out for the striking Church of St. Nicholas of the Weavers, which is located along the Tserkov Nikoli and competes with St. Basil's Cathedral for sheer gaudiness. The Novodevichy (New Maiden's) Convent is also known for its eye-catching domes and was established as far back as 1254, being located next to the Novodevichy Cemetery. Close by and to the south-west of the Novodevichy neighbourhood and within the southern Moscow region, the Luzhniki Stadium contains seating for up to 80,000 spectators. The neighbourhood known as Chistye Prudy includes the many streets around the Chistoprudny Bulvar, next to both the Pokrovka Ulista and the Myasnitskaya Ulista. Located on the north-eastern side of the Kremlin building, this district historically contained a large group of butchers and after its dirty ponds were cleaned up, it became known as literally 'Clean Ponds', which translates in Russian as, Chistye Prudy. Sights to see include the Menshikov Tower, part of the Menshikov and built in the early 1700s, and the Orthodox Yelokhovsky Cathedral, on the Spartakovskaya Ulitsa and close to the Baumanskaya Metro station. Literally translated as the district 'Beyond Moscow River', Zamoskvorechie heads southwards from the Kremlin building and sits inside a large loop of the river itself. Zamoskvorechie is home to one of the city's most famous parks, Gorky Park, which stretches for around 3 km / 2 miles alongside of the river and close to the Krymsky Most. Gorky is also known as the 'Park of Culture' and the entrance lies opposite the Central House of Artists (Tsentral'nyi Dom Khudozhnikov) on the Krymskii Val. Nearby, the National Museum of Russian Art (State Tretyakov Gallery) boasts the world's leading collection of Russian portraits. Lying to the south of the small River Yauza and famous for its 17th-century blacksmiths guild, the Zayauzie district is based around the noisy intersection of the Garden Ring's Taganskaya Ploshchad. Popular attractions within the Zayauzie area of Moscow include the Taganka Theatre on the corner of the Verkhnyaya Radishchevskaya, the 14th-century Andronikov Monastery (Spaso-Andronikov Monastyr) and the Andrey Rublyov Museum, both of which stand on the river banks, and the Novospassky Monastery, located slightly south of the Taganskaya Ploshchad and home to the Transfiguration Cathedral.